Early Bird Special Until December 20! Buy Season Tickets, Win Awesome Prizes! Until December 20, New York Lizards season tickets are available at a discounted rate, and purchasing enters you to win amazing prizes! Each week, one lucky season ticket buyer will be hand-delivered their winnings from the New York Lizards staff. The earlier you buy tickets, the more prizes you are eligible to win. Remember, there are now eight home games per season, and tickets start at just $20 per game! 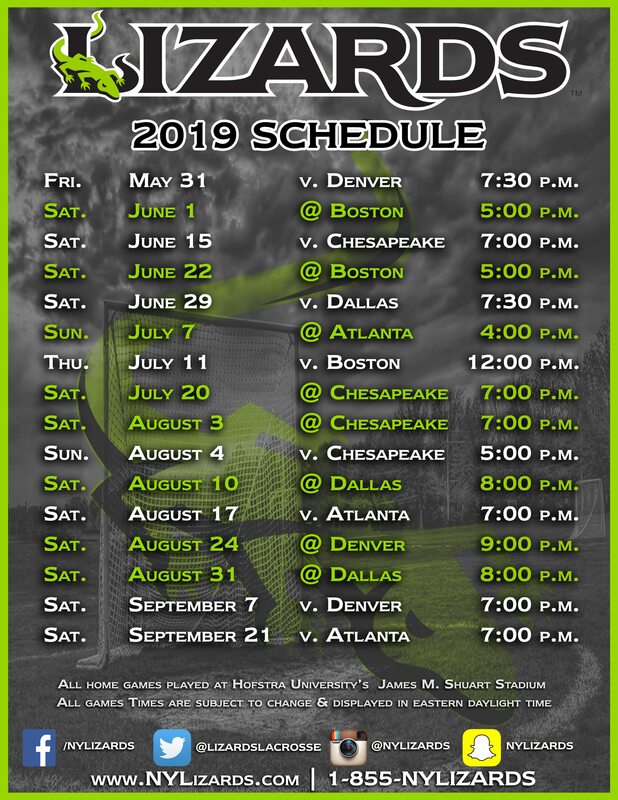 The New York Lizards season ticket packages give you access to every 2019 home game. You will also be invited to exclusive season ticket holder events, can purchase additional single game tickets at a reduced price, and every member can choose their own payment plan. Don’t miss a moment. Book your place in New York Lizards history today. Together, we Triumph. Become a Member of Our City, Our Legacy, Our Team. Witness every moment with a New York Lizards season ticket membership. Each of our membership tiers offers unique access to games, events, and our players. No matter if you are sitting at field level, or up in the stands, you will always have a full view of the game. Our team also offers flexible payment options. Speak to one of our representatives at 1-855-NYLIZARDS today for more info. This season, we need you to help defend our turf! Your loud and tenacious support from the sidelines gives us an on-field advantage at every home game. Over the past 17 years, every home win, every playoff hunt, and every championship run has started with you. Book your seat today for an unparalleled game day experience; meet our players, frequent the Beer Garden, and watch the game from the best seats in the house. Check out the views from Shuart Stadium here. GET YOUR SEASON TICKETS NOW!